I Will Never Forget by Elaine C. Pereira is a 2012 publication. I was provided a copy of this book in exchange for an honest review. 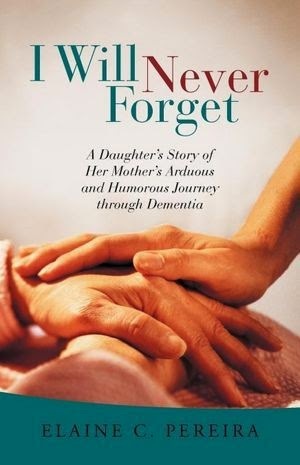 This is a non-fiction account of a daughter's journey through dementia with her mother. Elaine details the first inklings she had that all was not as it should be with her mom to the days when it became apparent her mother needed assistance to the final times when her mom was suffering more bad days than good. Through out this Elaine sprinkles fond memories of her childhood days and special moments with her mother. Betty Ward was an inspiring woman ahead of her time. She suffered heartache and loss, dealt with a series of blows in losing a child and the decline of her husband's health. She sets a wonderful example for daughter to follow later in life when she will face many challenges. As to the writing, there were times I had to wonder at the reasoning for inserting this particular story at this particular time. The author jumped from her mother's childhood, to her own childhood, to the present and then back through time again as she remembered key events. At times a person in the family that had died would pop up in a story later on and I had to wonder why she didn't put the events in some kind of chronological order so the reader would not lose track of what order things happened in. I don't mind skipping back and forth in time, but the organization could have been worked on a little bit. It had the feel of someone jotting down events as they remembered them and then never putting them into any particular order. Other than that one gripe, the formatting and grammar were fine and the author did a great job of bringing her mother to life , and giving the reader such a personal insight we felt like we knew her and felt great empathy for Elaine as she dealt with life's punches. Thankfully, as of this moment, I have not had a member of my family diagnosed with any form of dementia. However, as an employee in a retail establishment where the majority of the clientele were elderly, I saw my fair share of this type of situation. I have been told about moonwalks, and dealt with a few “escapees” from nursing homes which were close by. I have spoken with the adult children who now accompany their parent to the store and I've seen the toll it takes on them. There have been times when, although it wasn't really funny, something would be said that all of us had to laugh at, the family most of all. I had grown to care for many of these customers over the years and watching their slow decline was often emotional and painful. I can't imagine how I would feel if it were a member of my family and I had to deal with it on a daily basis as opposed to a brief once a week encounter. The signs are often so vague we fail to pick up on them right away. After all, all of us from time to time experience these types of symptoms. Losing keys, or a word won't come to mind and we have to search our brains for it. Stress and the effects of losing a spouse can also play a role in behavior changes. I saw this quite often . Vibrant, active, sharp senior citizens would become withdrawn, sloppy, and develop physical ailments after their spouse passed away. Sometimes we attribute those changes to grief and dementia is not the first thing that comes to mind. Elaine did a great job of caring for her mother. With her own marriage, career, children, grandchildren, and dealing with other monumental life changing issues, Elaine plowed on without complaint. She had the support of her husband and children to help her through difficult times. I admired her patience, felt for her loss as she watched the woman she knew and loved slowly disappear right in front of her eyes, and felt her inspiration. As my own parents age, I hope that I will have the strength and tenderness to deal with the challenges of aging and the heartbreaking decisions that often go with caring for a parent. This book does deal with a serious health issue and while there were comical moments, the book is not a fairytale, sugarcoated, watered down version of events. But, at the same time, reading Elaine's journey is thought provoking and for those who have one on one experience with dementia, it can be cathartic. For those of us not as acquainted with the disease it is a learning experience. I came away from reading this book with a greater understanding of the parent/ child bond, family ties, maturity, selfless love, and the way to handle life's hardships. There are no pat answers and no one has the exact same experience, but I think Elaine's story will strike a cord for anyone who reads this book. It must have been so hard yet so rewarding to write this book on behalf of her mom. Thanks Book Review for selecting and reviewing I Will Never Forget. My favorite line from your review: "the author did a great job of bringing her mother to life". Its a significant compliment as creating images through text only is crucial.